Dine with us from February 12th to 14th and sample the culinary talents of our chefs within one of our elegant dining rooms for Valentine's Day. Click to view our $60 Sweetheart Sampler Menu available February 12 & 13 or our full gourmet Valentine's Menu available on February 14 in our elegant dining rooms. 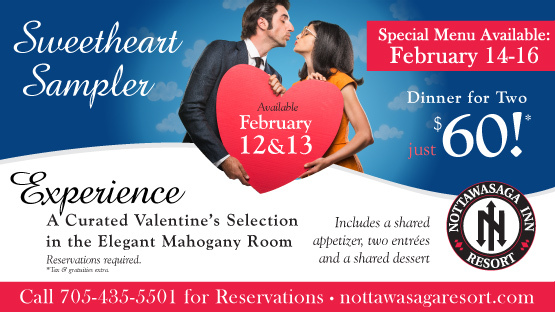 Reservations are required, please call 705-435-5501 to book today. Whether you're buying a gift for someone special or celebrating a milestone, a Nottawasaga Resort gift card is the perfect choice. Customizable to suit all budgets, our gift cards can be purchased for any of our services including getaways, a relaxing massage, a round of golf, or a delicious dinner in one of our restaurants. Available for purchase at the Front Desk, Sports Desk, Golf ProShops & Gift Shop.